One time, in an art class, the instructor was talking about composition and how people groups almost always form a “circle of love” and she demonstrated how you could overlay a circle connecting them – how hands held, arms entwined, heads positioned towards each other, etc. completed these circles physically drawing out the circle of their relationships. Thinking about this and papercraneprayer’s comment, I realized then that there is NOT ONE photo of me and my parents in anything resembling a circle of love or even close enough for anything resembling affection. There aren’t even any photos of me being held. And people wonder why I have intimacy issues…I mean, come on – look at the lack of circle in this photo! In every photo I have. In every photo of my siblings with my parents as well. And of course the adoptive parents are okay with the skin color difference: they’re not the odd man out. But ask the dark little girl in the photo above how she feels about it. Her answer will be affirmative because her parents are within earshot and she feels fear and obligation, but every cell in her body will be squirming in discomfort. I wonder if adoption agencies bother to look at people’s family albums? I bet they don’t. Would you send a child to a family that has NOT ONE candid photo of fun or affection? No of course not. But adoption agencies only look at income, criminal background checks, health records, letters of recommendation, and inadequate social worker home studies. All of which any psychopath with any skills at all or socially inept and maladjusted person could pass with flying colors. People have said to me in the past that this fate of mine had nothing to do with adoption – that these things happen in non-adopted families too, that some children are born into bad families and also don’t have any choice, that it is the luck of the draw. To this I vociferously disagree: adoption is an opportunity to do better than chance. A half dozen entities, coordinated by my adoption agency, all were guilty of negligence in their duties. Adoptive parents are too often just processed and not really screened – and they complain about the hoops they have to jump through. Well, there aren’t enough hoops. There isn’t a magnifying glass big enough. And nobody’s really looking through one anyway. Not in any meaningful way. The real me was crushed. Something terrible happened. And it was called international adoption. The scenery doesn’t really change. I’m still inhabiting this body. I’m still outside looking in. 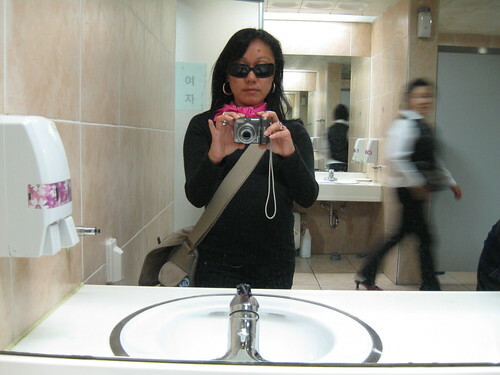 This is my first myspace generation type narcissistic self photo, taken in the bathroom of the Seoul Folk Flea Market. I like how it could have been taken anywhere, and I am standing still and the rest of the world is moving around me. It just seemed like what I should do at the time. And later, after attending the Disbursed and Returned exhibit about returning adoptees, it wanted me to post it and write about it. Having to continuously explain your existence is not necessarily a pleasant thing….When international adoptees no longer have to explain and justify their existence, the returnees are liberated from the coercion of continuous self-explanation. And yet I don’t have to do that here, not really. I recognize Rev. Kim is trying to elicit understanding from the Korean people, and the point he made later was that it is not us adoptees who have explaining to do: it is the Korean people who should be making explanations to us. Here, I blend in. Here, I am not one of you, though it’s obvious I should be. 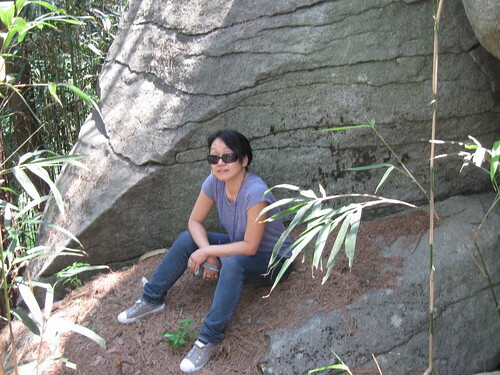 I really liked what Maria Hee Jung, returning adoptee from Denmark wrote. I think most adoptees realize that they don’t really have a country that is truly theirs, when they come to Korea. I think it would actually be easier for me to be accepted and to feel comfortable in a third nation without blood relation and anything else. It is precisely in the interstitial space, oscillating between this still unfinished reconciliation with the past and still on-going imagining of the future, that the adopted Koreans are appearing as comfort children in order to ease and console the homeless and orphaned Korean nation. Our return, for the 500+ of us who have done so, is perhaps even more important for Korea than it is for us. We adoptees were sacrificed in exchange for a better life: because they couldn’t see that they were already free, that it was only their colonized mind-set that enslaved them, and that they had the power to make change within themselves. They need to see and recognize us so they can move on to the next phase of their personal development. International adoption is a vector of deterritorialization in modern Korean society. The Korean adoptee syndrome is a politico-historical phenomenon that involves more than 150,000 adoptees who have been subjected to involuntary migration. And with the exception of a hyper-sentimentalized portrait of adoptees and their reunions with their birth families, which merely functions as a screen-memory, it is a phenomenon that has been wiped from the collective awareness in Korea. There is no mention of international adoption in Korean history books, nor is it part of the curriculum in Korean elementary or middle schools. Myths and deliberate distortions of the history of international adoption are widespread. Only the most progressive elements of Korean society are able to see international adoption as a dark side of the militarized industrialization of the modern Korean society. International adoption is a constitutive blind spot in the modern Korean society. The Korean adoption syndrome raises a number of questions about the phenomenological experience of adoptees returning to Korea and their historical and political position in the Korean society. While the traditional approach is to explain international adoption by referring to various antagonisms in the Korean society, I maintain that the study of international adoption provides a unique opportunity for us to gain understanding of modern Korea and its phenomenal rise in the international order of industrialized nations. My journey to Korea has been forty years in the making. My radicalization has been forty years in the making. It is not enough to sit back and observe and let this life happen to me. Fatalism is not productive. And people who read my works volley back to me that I am negative or angry. And to that I say: Sorting through this morass of complicated issues is a positive action. Coming here to live is an act of bravery. Confronting Korean society and questioning the world’s assumptions about adoption is based upon a love of humanity and a faith in the capacity of people to change for the better. You must turn over the soil and make a new bed before you plant new seeds. Returning to Korea is a journey of discovery. It is a discovery of an entire world of sounds, smells, and extraordinary sensations. The magical country that was only a vague fantasy during childhood and adolescence suddenly becomes very concrete: the pushing and jostling in the subway during rush hour, the army of impeccable suits and high heels, the ringing of a bell in a Buddhist temple, the unbearable hot and humid summer. It is a pleasing shock to discover that for some people, the Koreans, this is the center of the world. However, returning to Korea is first and foremost a journey of self-discovery. It is an experience of radical disjunction between the past and the present, the West and the East, the mind and the body. It is a threatening experience that destabilizes and decenters the world of the adoptee: returning to Korea is an experience of oneself as an other; it is an experience of radical deterritorialization in which everything, including the very core of our self, is being questioned; and it is, at least potentially, an experience of emancipation and empowerment. So yeah, I’ve been abandoned and exiled and abused and marginalized and silenced and OF COURSE that makes me angry! But once upon a time, I didn’t know I was angry. I was uncomfortable, but couldn’t verbalize it. Later, I realized that internalizing discomfort was really hurting me. I can ignore my discomfort and swallow my anger and hurt myself, or I can work to make it so no child in the future has to experience such avoidable trauma. Righteous anger has powerful energy, and channeling that energy is how the world changes for the better. I am certainly destabilized here, and it effects me. But I try to learn from the past and persist into a future where I can contribute to society in the most meaningful way possible. This is what optimism looks like. Cause for celebration last year was the reporting that Korea intended to eliminate international adoption in the next four years. It has been four years since the first Adoption Day was launched in Korea promoting domestic adoptions, and last year was the first year that domestic adoptions exceeded international adoptions. However, we have learned that our celebrations were premature. The domestic adoptions will continue to exceed international adoptions by a slim margin. However, the end to international adoption will remain only a topic of discussion because sources tell me that a back room quota system is in play, allowing an almost one for one advance. So, as long as domestic adoptions are promoted, for each domestic adoption (save the margin permitted to make it appear as if domestic adoptions outnumber international adoptions) an international adoption will be allowed to take place. So actually, even the campaign for domestic adoption is being used as a vehicle to increase international adoption by politicians and multi-national corporation international adoption agencies. In the past, North Korea has admonished South Korea as being a baby selling nation. Hopefully, they will hold onto that belief and protect themselves from multi-national corporation aggression meaning to capitolize on their hardships. If Holt wants to help children so much, they need to get out of the creating orphans business and get into the business of helping families in crisis instead of breaking families up. Hopefully that is what they are doing. But given their track record, it’s highly unlikely that they will be willing to stop at aid. We’re aware. And we’re watching.